Congolese women and children arrive at a border point in Chissanda, Lunda Norte, Angola after fleeing militia attacks in Kasai Province, Democratic Republic of the Congo. 2 May 2017. The election of President Felix Tshisekedi in the Democratic Republic of the Congo (DRC), marks “an extraordinary opportunity” for the country to advance civil and political rights, said a senior UN official, on Tuesday at the Human Rights Council in Geneva. UN Assistant Secretary-General for Human Rights (OHCHR), Andrew Gilmour, welcomed Mr. Tshisekedi’s inaugural speech in January, in which he made a “clear commitment” to respect citizens’ rights and end discrimination. The president’s recent decree ordering the release of all political prisoners was also to be welcomed, Mr. Gilmour said, in anticipation of their actual release and the closing of all unofficial detention centres. Mr. Tshisekedi’s unexpected election win on 30 December, despite a week’s delay due to logistical concerns, coming on top of a two-year delay due to former President Joseph Kabila’s reluctance to leave office, marked the first peaceful transfer of power in the country of more than 80 million, since independence from Belgium, almost 60 years ago. Mr. Kabila governed DRC for 18 years, before agreeing to step down last year, although his former ruling coalition has a majority in the legislature. In his inaugural speech in late January, according to news reports, the new president said he and his party were committed to building a modern, peaceful, democratic State, and pledged then to release all political detainees. The Assistant Secretary-General’s comments coincided with the publication of a report into DRC violence and rights abuses, in 2018. 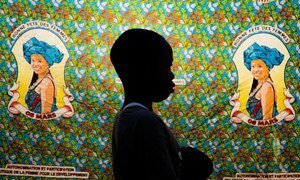 It found that more than 1,100 people were killed in conflict-related violence, almost 900 were subjected to sexual violence in a war-setting, including 279 children. On the continuing inter-communal violence in the province of Mai-Ndombe, around Yumbi town, that left hundreds dead last December following an orchestrated and well-planned massacre, Mr. Gilmour urged the authorities to extend the rule of law throughout the country. There is an urgent need to take measures to defuse tensions and promote reconciliation in the region and avoid further bloodshed, he said, and to ensure that those responsible are prosecuted. In reply, Marie-Ange Mushobekwa, Minister of Human Rights in DRC, said that those responsible for the Mai-Ndombe killings, in the west of the country, on the banks of the Congo River - and earlier massacres in the Kasais - would be prosecuted. And she said convictions had been announced in association with the killing of UN experts, Michael Sharp and Zaida Catalan in Kasai on 12 March 2017. The highly-regarded experts on the region, were brutally murdered while investigating reports of mass atrocities in the Kasais, around conflict between the Kamuina Nsapu militia and Government forces. The fallout from the case continues, with a Congolese army colonel, reportedly arrested in connection with the killing of the two UN monitors, early in December. 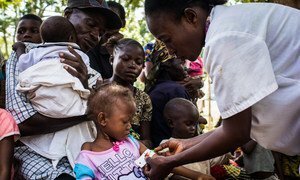 More than a quarter of a million children in the Kasai region of the Democratic Republic of the Congo (DRC) – and thousands of others who have fled with their families to nearby provinces – are suffering severe and acute malnutrition, and need lifesaving treatment, said the UN Children’s Fund (UNICEF) on Wednesday.